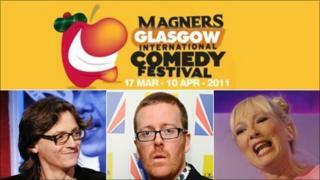 Frankie Boyle, Ed Byrne and Jenny Eclair are among a host of big names who will perform during the 2011 Glasgow International Comedy Festival. The event, which is now in its ninth year, starts on 17 March and runs for 25 days, with over 115,000 tickets available for more than 400 shows. Over 50 venues in the city will host gigs, from the SECC to cabaret rooms. Sketch, film, cabaret, music and theatre shows will feature along with traditional stand-up. Having announced that he will give up touring, Frankie Boyle will be back for his only live show of 2011 at the King's Theatre. The event is to raise money for the Palestine Legal Aid Fund. Other big names performing include Jerry Sadowitz and comedian and political activist, Mark Thomas. Tommy Sheppard, director of the Scottish Comedy Agency, the company behind the festival, said: "The festival is becoming one of the most anticipated events on Scotland's cultural calendar and the calibre of acts is a fantastic reflection of this. "This year is bigger and better than ever before and with a range from Frank Carson to Frankie Boyle we really do have something for everyone." Scott Taylor, chief executive of Glasgow City Marketing Bureau, said: "The Magners Glasgow International Comedy Festival has gone from strength-to-strength since it began almost a decade ago. "This year's festival boasts another stellar line-up from home and abroad, which will reinforce its reputation on the global comedy circuit while further demonstrating Glasgow's ability to successfully host major international events."